See the sites at night. The Pantheon, Trevi Fountain, and Colosseum are close to each other. During the day, these monuments are swarmed by tourists. But at night, when the streets are quiet, there is nothing to do but be in awe. Visit the Vatican at night or dusk when St. Peters is lit up – also beautiful. Get lost. While this is a piece of advice that anyone studying abroad will tell you, I am repeating it to emphasize its importance. I live in a vibrant, young neighborhood of Rome. Trastevere is easy to stay in and navigate after a week. Turning off my navigation and going down the wrong streets is how I got to know the city better – it’s also how I got to the Spanish Steps. Take a food tour. What’s good in Rome? Pasta and pizza obviously but going on the food tour actually taught me what to look for in the local cuisine. A few key things I learned:- Three must-eat pastas in Rome: Amatriciana, Carbonara, and Cacio e Pepi. The best Grattachecca (Italian Ice) will have a thick consistency of crushed ice – i.e. not your average 7/11 Slurpee. Slow food restaurants are where to go for authentic Italian. They produce and prepare the meals in accordance with local culinary traditions and typically use high-quality locally sourced ingredients. And lastly, “clinking” wine glasses originated as a defensive mechanism: if your glass was poisoned and you clinked glasses hard enough with your neighbor, that ensures that he too would be poisoned. Talk to the locals. There is no point to living in a new culture if you do it with blinders. There is a homeless man I pass everyday walking to campus who always kindly smiles and says, “ciao belle.” One afternoon I stopped to have a conversation past, “ciao.” Though we communicate with awkward gestures and head nods, it makes my day better when I see him and we greet each other by name. Take a cooking class. 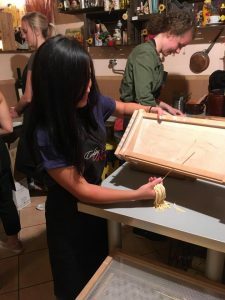 Beyond learning about the cuisine, knowing how to make bruschetta three different ways and your own pasta noodles is an impressive trick to have up your sleeve. There are several ways to get around Rome. Finding new running paths and destinations is one way that I’ve gotten to see Rome. Running along the Tiber River is always lightly trafficked with bikers and other joggers, making it a good place to exercise. My friend and I stop at different bridges and explore the area then head back to the river. Some of the places we’ve discovered running are the Vatican, Italian Court House, and the Basilica of St. Paul. Grab a pastry from Dolce Maniera. 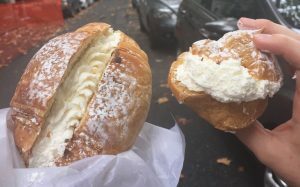 I truly felt Italian walking into this small, hole-in-the-wall bakery. Easily passable to the untrained eye, the sign for the bakery is faded above the door and partially covered. The room itself is about the size of a master bathroom and therefore, always a take-a-way order always. The one euro chocolate croissants, and two euro mini pizzas are definitely worth the line. Sit on the steps. There is almost nothing more Italian than meeting in a Piazza and sitting on the steps. Piazza Trilussa is a good area to people watch, catch some music entertainment, and fill your water bottle for free. There is one artist named ROMAN (how appropriate) who sings covers and is even on Spotify! Take an on-site class. My Ancient Rome and Monuments class brought me to museums, ruins, and forums that I would have never visited. 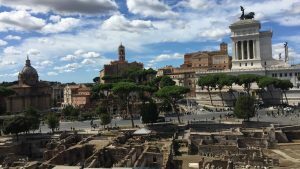 The Capitoline Museums and Palazzo Massimo are two must-see museums that the class has taken us to. 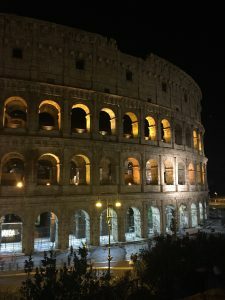 Studying abroad means your classroom is Rome –take full advantage of that and take a class that drops you right into the history. — Lucy is an SAI Rome student from Lindenwood University.